The Cereus blooms once a year at night.Did you ever wonder what your neighbors, flashlights in hand, were doing in the garden between 9pm and midnight? Exactly what kind of furtive activity were they pursuing, popping in and out of their houses, eventually emitting a few groans of surprised delight? I’ll bet that members of the Gardening Club know. Several years ago a friend called and told me that her friend was moving and was giving away her pots of plants. 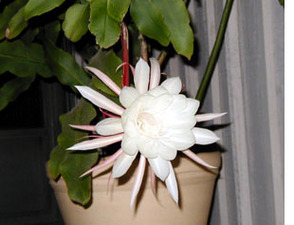 Was I interested in owning a Night-Blooming Cereus that flowers just one night a year? Um, was I? Was it something that my delicate and pretty brown thumb could handle? I was assured it was, so I trundled over to the designated patio and set my eyes on a spindly, straggly and generally unkempt-looking orphan. Perhaps I’ve got the runt of the litter, I thought, and those ugly burn marks must be signs of plant abuse. Better get it home and administer CPR (Cactus Plant Revival). Once at home, I dithered around deciding where she should have her new home and placed her in a sunny location. Wrong move. A few days later, after I decided to Google-up some information, I found that these plants do not do well in direct sunlight. This was after bumbling around looking up “Sirius” instead of “Cereus”, and yes, by that time I was getting serious about its welfare. Also known as “Queen of the Night” and “Queen of the Desert” it thrives in warm climates all over the world, rewarding the vigilant with showy displays of large 7-inch blooms that are guaranteed to take your breath away. For the uninitiated, the once-a-night, one-day-a-year flower can easily be missed, and disappointment flows easily upon the morning discovery of a spent, bedraggled flower. And that is why your neighbors, the night-stalkers, are out spying on the progress of their plant. My first plant grew and grew once I pulled it up to a wall, where it absorbed the heat from the bricks. The cactus-like plant produced large fleshy leaves that took on a shiny, red tinge of health, but it was still the prime ugly duckling of the plant world. Nothing happened. No “hello, I’m here” noises, and definitely no royal commands for attention. Benign neglect was surely the way to go, along with a few soakings of water. One day, I noticed a protrusion along one of the leaves, it looked different from the other growth (standard for the genus Epiphyllum Oxypetalum) and it matured daily until it formed a long, tight bud. The watching season began. The bud enlarged into a bulbous state and began to point upwards, which was a sure indication that something was going to happen. Seven nights later a flashlight illuminated the gradual opening of layers upon delicate layers of creamy-white petals, revealing an exquisite tribute to nature. On close examination by magnifying glass, the center orchid-like throat displayed an additional mini-flower tucked behind the yellow-tinged stamens that were thrust out waiting for pollination. Although our excitement was centered on taking photographs and calling everyone we knew to come for a viewing, it was hard to ignore the indescribable heady fragrance permeating the air. Here was Mother Nature at her finest, treating us, the privileged, to a glimpse of perfection for a very short time. It was a “wow” moment. Subsequent years found us taking better care of the plants and being rewarded with bumper crops, sometimes numbering 21 in an evening. We fed them dried coffee grounds to encourage more blooms and presented cuttings to the favored few. Not so long ago, we plucked up courage to prune them a little, which didn’t hurt a bit. Encouraged by our success, we even started snipping the flowers as they started to unfold and took them indoors to watch the “opening” exhibition. What a treat, no more sneaky nocturnal visits to the patio lit by the narrow beam of a flashlight, we can fully enjoy them indoors. It stands to reason that now the only one beaming is me.